Back in 2011 I started a project--using my Galileoscope, I wanted to reproduce some of the sketches that Galileo published in his landmark treatise Sidereus Nuncius, published in 1610. Eight years later, I've gotten most of them (see here in my Galileoscope sketches) and last night finally caught up with Orion. Now, my plastic Galileoscope has much better optics than what Galileo used and a field of view bigger than his telescope (although still small--about 1 degree). But I found this observation and sketch to be *very* difficult to do. The belt and sword area is 3-4 degrees wide and 4-5 degrees long. I could only see a little bit of it at a time--it was hard to get the correct spacing between stars and the correct placement of their relative positions. 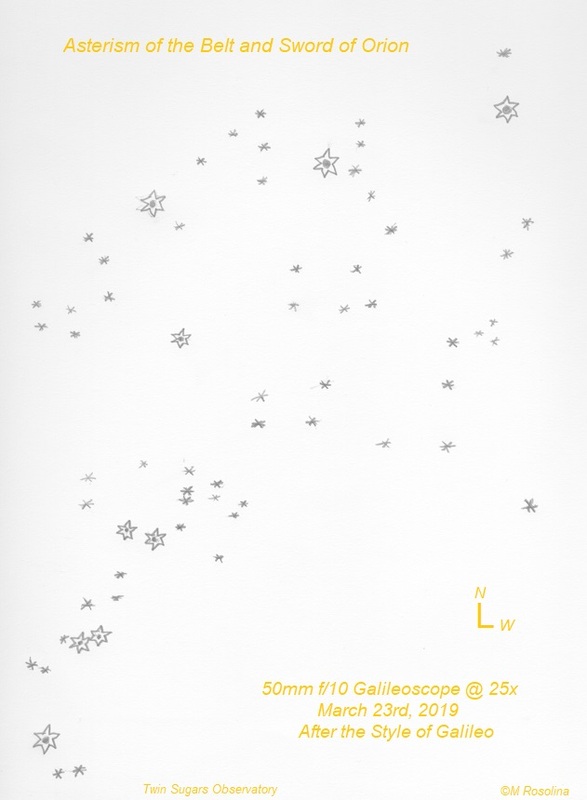 Galileo wrote that he originally planned to sketch the entire constellation of Orion (!) but was overwhelmed by the enormity of the task so he decided to focus on the belt and sword. He sized the stars according to magnitude and made the 9 or so visible since antiquity the largest. He was able to see and plot the positions of about 80 stars that he could see with his telescope (I plotted about 60 before I gave out). He did not record the Orion nebula (M42). Some speculate that he could not see it with his telescope but I don't agree--I could see it--but not in detail. Since he had already shown that nebula known since ancient times like the Praesepe (M44) were actually collections of stars when seen through the newly invented telescope, I agree with those who say he decided to wait to explore the nebula until he had a more powerful telescope (but I don't think he ever got to it). Here is an annotated version--I think it's relatively accurate. Small telescopes have improved over the years as they reached the limits of diffraction. Nice sketches of In the Footsteps of Galileo...Orion's Belt & Sword . Frank, T10, Jef, and Tom--thank you! We do benefit greatly from the advances in optics and telescope making since Galileo's time--which makes the discoveries, observations, and sketches of those working in the 1600's and 1700's that much more...impressive?, awesome?, mind-boggling? I don't know--words fail me. Trying to be in Galileo's shoes and reproduce an observation like this really emphasizes how difficult it was back in those days. And my little plastic telescope on a camera tripod is sooo much better than what he used. I have read that Galileo's first telescope had about a quarter of my telescope's one degree FOV. After doing my sketch of Orion's belt and sword and upon reflection, I'm guessing that Galileo started his sketch by placing the naked eye stars in the belt and sword on his paper first and then used his telescope to fill in all the dimmer stars that can't be seen without aid around the bright ones. Pure speculation on my part, but doing the sketch myself gave me that insight (I wish I had thought of it before I did the sketch! ). Wonderful and fun sketch Special Ed. Thanks, Bernardo. I agree--when you read Sidereus Nuncius , Galileo's excitement comes right off the page. I think those students who tried to recreate Galileo's observation using the 15 arcminute fov are on to something. He probably starhopped like they described but would have had to go slowly and carefully. One small advantage that he had was that his telescope did not invert the view. His Pleiades sketch is very accurate--and he included that arc of stars that is so prominent. 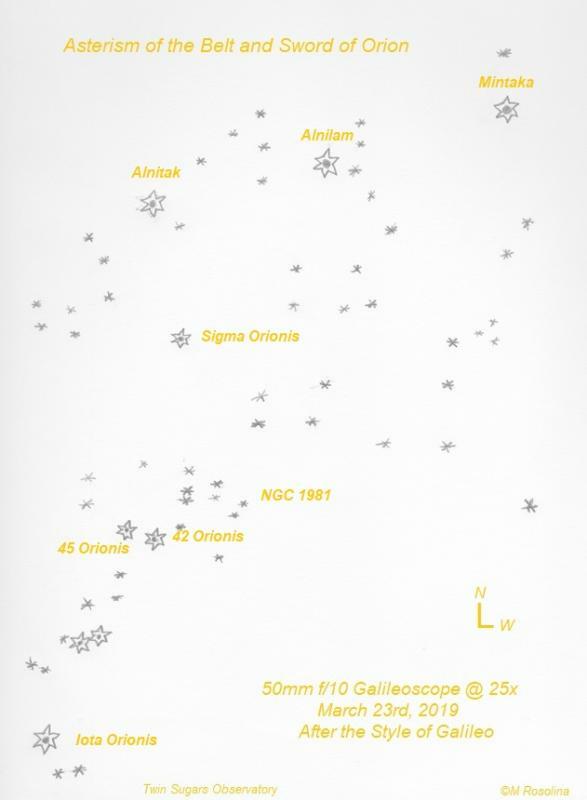 He also might have started the sketch by placing the naked eye stars on the paper before using the scope (like I speculated about his sketch of Orion's belt and sword).